This short, well-written book notes that we all agree that we are supposed to treat others with compassion and respect. While adopting a plant-based diet is a rather obvious choice if we wish to have our actions align with our ethics, being an ethical vegan isn’t just about food. Compassion should guide all our interactions with the nonhuman world, and the same principle should apply to our treatment of fellow humans. And, being vegan is not only about making certain lifestyle choices; it is also about activism. 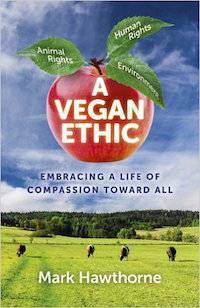 Vegans need to show other people the benefits of compassionate living for themselves and the rest of the world. Hawthorne helpfully shows people how to transition to a vegan lifestyle, navigating the social and dietary challenges that many newer vegans often face. He also discusses how animal advocates should, and should not, intersect with other social justice movements. Another section addresses many of the questions and concerns raised by those who are skeptical of plant-based eating, such as whether eating the flesh “humanely raised” animals is acceptable, and whether more animals are killed to raise plants than to raise animals for food. I also recommend Hawthorne’s other two books on animal rights: Bleating Hearts: The Hidden World of Animal Suffering and Striking at the Roots: A Practical Guide to Animal Activism. I think we should be grateful for Hawthorne’s passion, commitment, and contributions toward having the world adopt a vegan ethic. Mark Hawthorne is the author of three books on animal rights: A Vegan Ethic: Embracing A Life Of Compassion Toward All, Bleating Hearts: The Hidden World of Animal Suffering, and Striking at the Roots: A Practical Guide to Animal Activism, which empowers people around the world to get active for animals. He stopped eating meat after an encounter with one of India’s many cows in 1992 and became an ethical vegan a decade later. Mark’s writing on behalf of animals has also appeared in such vegan magazines as Satya, VegNews, Laika, and The Vegan, and you’ll find his work featured in Vegan’s Daily Companion and in the anthologies Uncaged: Top Activists Share Their Wisdom on Effective Farm Animal Advocacy, Turning Points in Compassion: Personal Journeys of Animal Advocates, and Stories to Live By: Wisdom to Help You Make the Most of Every Day.